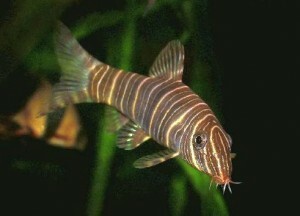 The Zebra Botia Loach (Botia striata) is also called the Zebra Loach, Tiger Loach, Lined Loach, or Candystripe Loach. It is a peaceful shoaling species that is found in the clear mountain streams of Maharashtra and Western Ghats, India. The Zebra Botia Loach is similar to Botia rostrata, the “Seargent Major Loach” in appearance. The Zebra Loach has its entire body and fins barred with alternating tan and dark brown, to near black stripes. This gives the fish a unique appearance which is prized by tropical fish keeping enthusiasts. Like other loaches it has four pairs of barbels protruding from its mouth. Females can be distinguished by their rounder abdomens. Although the Zebra Botia Loach is sometimes thought to be a scaleless fish, they do posess very small scales. Zebra Loaches are active, peaceful, semi aggressive shoaling scavengers that enjoy the company of their own species. Like other loaches that originate from tropical streams, they like to school with others of their own age, size and species. They should be kept in small shoals of 6 or more fish a community aquarium. Zebra Loaches need a fine sandy substrate in their tank which should be densely planted and aquascaped with plenty of smooth rock caves, holes, bogwood (or driftwood ) and other hiding places. Their aquarium should be provided with soft, well filtered, slightly acidic, highly oxygenated water, and a moderate current to mimic their natural environment. Zebra Botia Loaches should be fed small portions of food several times during the day. They will accept most brands of sinking catfish pellets and flake foods but they should also be given a variety of frozen and freeze dried foods to supplement their diets. Brine shrimp, daphnia , mosquito larvae, bloodworms and some fresh vegetable matter like a slice of cucumber will keep them healthy and active. Zebra Loaches will quickly rid your aquarium of unwanted snails that creep into your tank. The breeding habits of this species are not known and although there have been several accounts of females becoming gravid in home aquaria, no proven accounts of spawning have been documented and successful captive breeding has yet to be recorded. Because of their small size, unique markings and peaceful disposition; Zebra Botia Loaches or Candystripe Loaches make a perfect choice for most community tank settings. When available for purchase, Zebra Loaches are usually 1-3/4″ to 2-1/2″ in length.